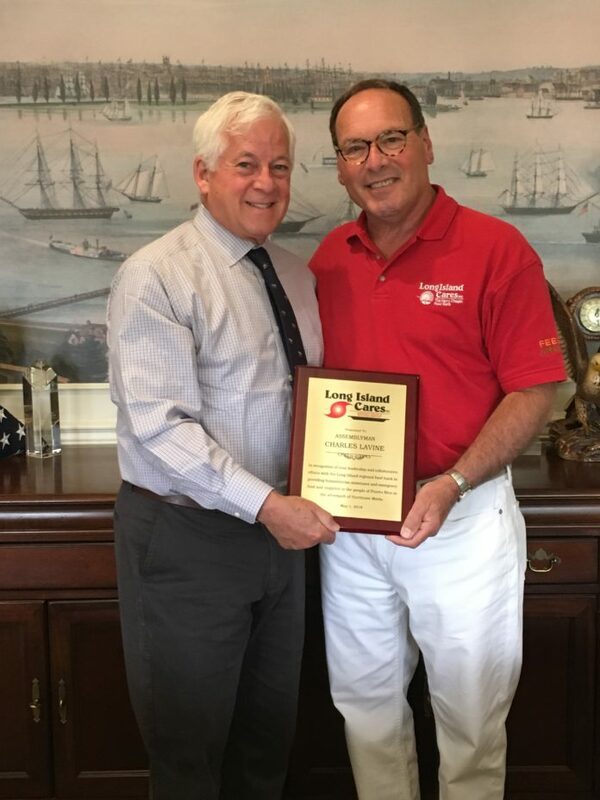 New York State Assemblyman Charles Lavine was presented with a plaque by Paul Pachter, CEO of Long Island Cares. Lavine was recognized for his help during the Long Island Cares supply drive that assisted those in need in Puerto Rico. There were 269,000lbs of water, food, cleaning products, and pet supplies distributed to 12 locations in Puerto Rico by the New York National Guard. Lavine helped collect necessary supplies for the people living in Puerto Rico whose lives were affected by Hurricane Maria. Many still are left without electricity and clean, running water. Long Island Cares provides many resources for people in need. The organization’s food drives collect much-needed donations of personal-care items, baby-care supplies, seasonal items and nonperishable food, which are distributed to benefit the hungry and food insecure on Long Island.